With my silence or inactivity on this series, you’d be right to wonder if I didn’t have much to say about the African-American church in her heyday. You’d be right to wonder, but you’d be wrong to conclude that. I’m in Birmingham, AL currently, enjoying the sweet fellowship and hospitality of Harry Reeder and the saints at Briarwood Presbyterian. I’m in the heart of the South, and the literal stomping grounds (marching grounds) of the Civil Rights Movement. Fifty years ago, a revolution rang out from this place. The society Americans now live in was unimaginable just a generation or so ago. What happened? Lots of things happened. Television entered the American home and for the first time Americans saw graphic images of wars abroad and of church bombings, attacking dogs, water hosed children and so on. The pictures of good looking, promising young men like Goodman, Cheney, and Schwartz were flashed on the screen. Television changed how America saw itself. 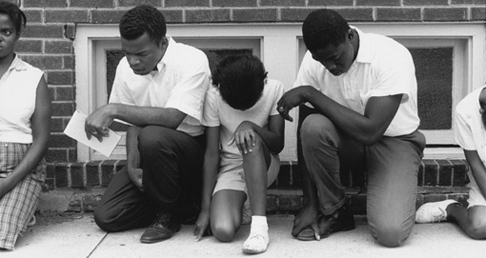 It shrank the country so that families in Ohio could readily see the happenings in Selma and Atlanta and Montgomery. And many, many people, black and white, did not like what they saw. Television happened. But that wouldn’t have been such a big deal if the African-American church hadn’t happened as well. It’s a well-worn fact that the African-American church was home base and launching pad for the Civil Rights Movement. There would not have been a movement if there had not been a Black Church. And not just a Civil Rights Movement, but arguably an Abolitionist movement either. Through most of her long and storied history, the African-American church has maintained a tenacious grip on justice as a necessary outworking of the gospel. This is what makes men like James Cone so nearly right when they write about liberation as the gospel. But in being nearly correct they are completely wrong. Liberation is not the gospel. Whether folks are ever liberated or not, the gospel remains. And the freedom that Christ came to give us (Gal. 5:1) is not bound in chains or behind bars or paroled with out bodies. Justice, liberation, mercy are outworkings of the gospel but not the gospel itself. In her prime, the African-American church knew this and lived this. But even if that caution is correct, to preach the gospel and have no concern and take no action in the cause of justice is as much an abandonment of the gospel as mistaken the gospel. How can a faithful gospel preacher preach the gospel before slaves and never wince at the gross barbarity of that peculiar institution? How can a man claim to live the gospel with fellow brothers in Christ and yet uphold laws that disenfranchise, marginalize, and oppress those same brothers? They may gospel doctrine down pat, but they don’t have gospel living at all! Having a form of godliness, they deny the power thereof. Not so with the African-American church and the many faithful Christians she birthed who laced up worn but shined shoes, straightened their ties and their backs, and marched in love for justice. At her best, she not only understood the gospel but felt the irresistible impulse of the gospel to do something consistent with the gospel in the face of injustice. Today, to many gospel preachers preach and teach in such a way that the fine edges of the gospel are shaved, sanded, and smoothed until the gospel only tickles rather than pierces. We need to learn from the African-American church how to pursue justice precisely because we understand and live the gospel. And we need to learn from the African-American church that justice and liberation are not idols to worship, or themes to supplant the gospel. Black Church history has enough in it to teach both sides of the issue, to keep us from falling off either side of the horse. My dear brethren, we are many of us seeking for a temporal freedom, and I pray that God would grant your desire. If we are slaves, it is by the permission of God. If we are free, it must be by the power of the most high God. Be not discouraged, but cheerfully perform the duties of the day, sensible that the same power that created the heavens and the earth and causeth the greater light to rule the day and the lesser to rule the night can cause a universal freedom. And I pray God may give you grace to seek that freedom which tendeth to everlasting life. But now our glorious high priest hath visably appear’d in the flesh, and hath Establish’d a more glorious Oeconomy. He that not only visably Broken Down that wall of partision that interposed Between the offended majesty of Heaven and rebellious Sinners and removed those tedeous forms under the Law, which savoured so much of servitude, and which could never make the comers thereunto perfect, By rendering them obsolete: but he has removed those many Embarisments, and Distinctions, that they were incident to, under so contracted a Dispensation. So that whatever Bodily imperfections, or whatever Birth we sustain, it Does not in the Least Debar us from Gospel previlege’s. Or whatever hainous practice any may be gilty of, yet if they manifest a gospel repentance, we have no right to Debar them from our Communion. And it is plain Beyond all Doubt, that at the comeing of Christ, this curse that was upon Canaan, was taken off; and I think there is not the Least force in this argument than there would Be to argue that an imperfect Contexture of parts, or Base Birth, Should Deprive any from Gospel previleges; or Bring up any of those antiquated Ceremonies from oblivion, and reduce them into practice. But you will say that Slave-keeping was practiced Even under the Gospel, for we find paul, and the other apostles Exhorting Servants to be obedient to their masters. To which I reply, that it mite be they were Speaking to Servants in minority in General; But Doubtless it was practiced in the Days of the Apostles from what St. paul Says, 1 Corin. 7 21, art thou called, being a servant? care not for it; but if thou mayest Be made free, use it rather. So that the Apostle seems to recomend freedom if attainable, q.d. “if it is thy unhappy Lot to be a slave, yet if thou art Spiritually free Let the former appear so minute a thing when compared with the Latter that it is comparatively unworthy of notice; yet Since freedom is so Exelent a Jewel, which none have a right to Extirpate, and if there is any hope of attaining it, use all Lawfull measures for that purpose.” So that however Extant or prevalent it might Be in that or this age; yet it does not in the Least reverse the unchangeable Laws of God, or of nature; or make that Become Lawfull which is in itself unlawfull; neither is it Strange, if we consider the moral Depravity of mans nature, thro’out all ages of the world, that mankind should Deviate from the unerring rules of Heaven. Haynes grew up an indentured servant as well. Served in the American Revolution. Was largely self-taught. Didn’t have the advantages of many of us today. And yet he saw clearly that the gospel and justice go together like hand in glove. Sometimes I wonder if in the comfort western Christians almost universally enjoy we don’t make this more difficult than it needs to be. How about Zech. 7:9-10. We may learn this from the best of the African-American church tradition.